Dr. Dinesh Shrivastava was the Chief Guest for the Hindi Diwas program. Dr. Shrivastava has been one of the leading lights in Melbourne for promoting and teaching Hindi. 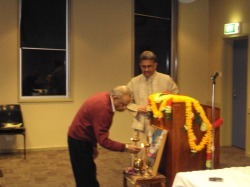 He presented a brief discourse on how Hindi teaching began in Melbourne, and thanked the original organisers of Sahitya Sandhya, Mr. Radhey Shyam Gupta and Mr. Ratan Mulchandani. Furthermore, he presented a list of ideas to ensure that Hindi holds its place amongst Indian Diaspora in Australia, and the world. His main point was that we need to have programs such as the Sahitya Sandhay to provide a venue for Hindi lovers to congregate and enjoy its beauty, and urged it current organisers to persevere with it. Hindi maa ke charno me ham pushp chadhane aae hain. Aaj sabhi ham mil kar Hindi Diwas mananay aae hain. We bow to thee our mother Hindi, and lay flowers in your lotus feet. We have come hither, to celebrate Hindi Diwas together. Hindi bhasha too meeti aysee, jyon madhur suron kee hovay taan. Man main uthtey sab bhavon main, kaise hai too phunke jaan. Hindi language how sweet are thee, just as the sweet notes of a melody. To all emotions rising in my heart, how you mange to, life impart. Mr. Harihar Jha presented a Gazal in Hindi. Mr. Harihar Jha explained that while the Gazal is normally associated with the Urdu language, it can be written in Hindi as well. The term Gazal has more to do with the form, rather than the language. He presented the following sublime Gazal, full of heartfelt emotions, followed by a poem which has been published in the "Anubhuti" web magazine. dukhi dil jee bhar kar ab ronaa chaahtaa hai. But the heart wants to weep and cry to my heart’s content. chehraa jagmag huaa, bhitar yahaan kichadra bharaa hai. The mask is dazzling but full of filth inside. Please send me inforamtion about your presentaion so that I can add it here.